Reaching Tuguegarao from Baguio City will take approximately 10-12 hours while if coming from Manila, will take about 11-12 hours. 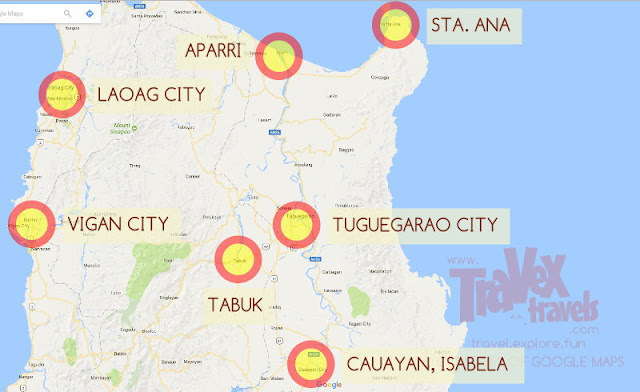 To reach Tuguegarao from other cities, it will probably take you 8 hours if coming from Urdaneta, 8 hours from Clark area, and 9 hours from Subic. If coming from Baguio with private car, you can take National Highway route (McArthur), go south direction, enter TPLEX at nearest entrance (once finished in 2019, it should be Rosario; by 2018, Pozorrubio, 2017: Binalonan) then exit to Carmen all the way to San Jose City, Nueva Ecija passing through several towns in Pangasinan (Umingan) and Nueva Ecija (Lupao). 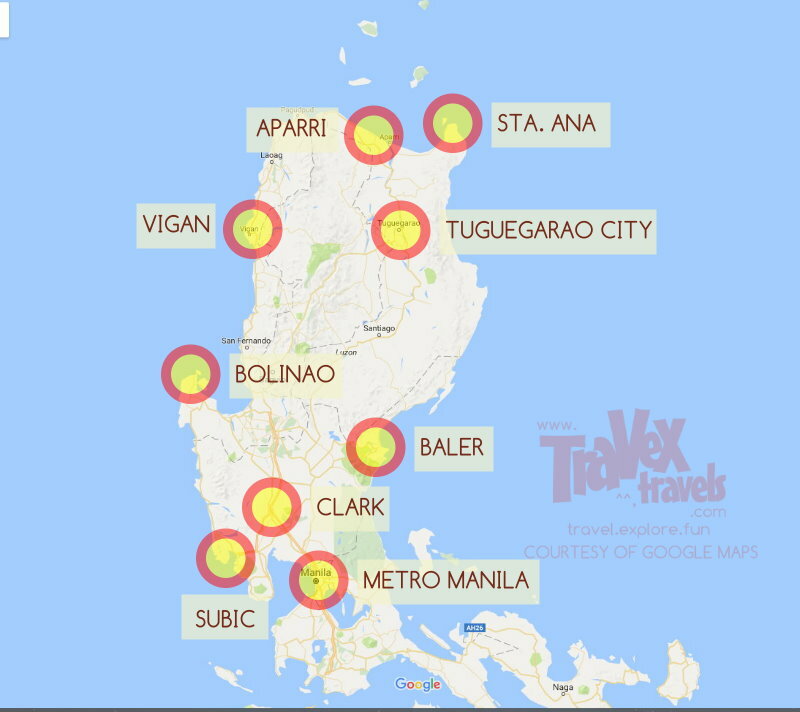 From there, San Jose to Tuguegarao City will pass through the several cities and towns in Nueva Ecija, Nueva Vizcaya, Isabela then Cagayan. 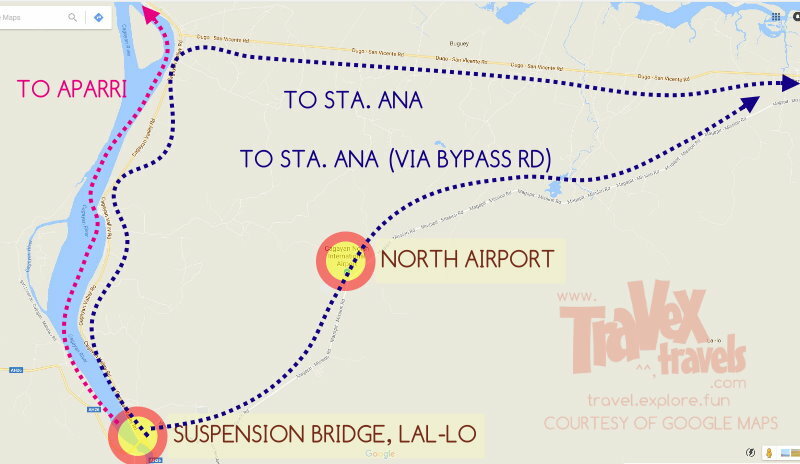 *If coming from Baguio and taking roads north side, reach Pagudpud via National Highway then to Claveria, all the way to junction (Suspension Bridge) in Lal-lo Cagayan. 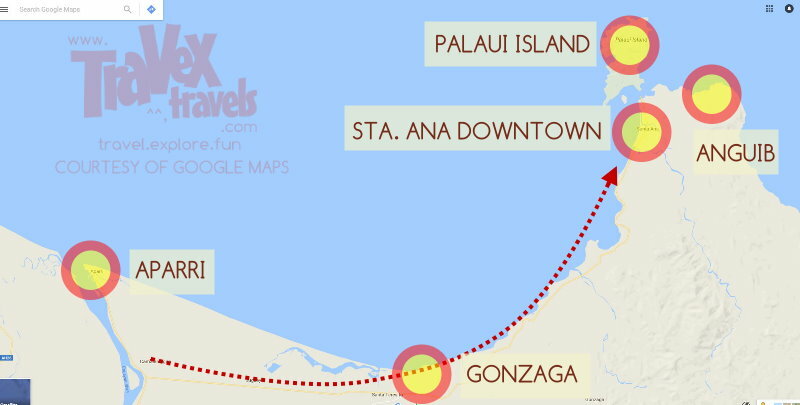 If coming from Manila, take this direction—NLEX-SCTEX-TPLEX, from Pura Exit of TPLEX, go all the way to Science City of Munoz, then San Jose City, Nueva Ecija. 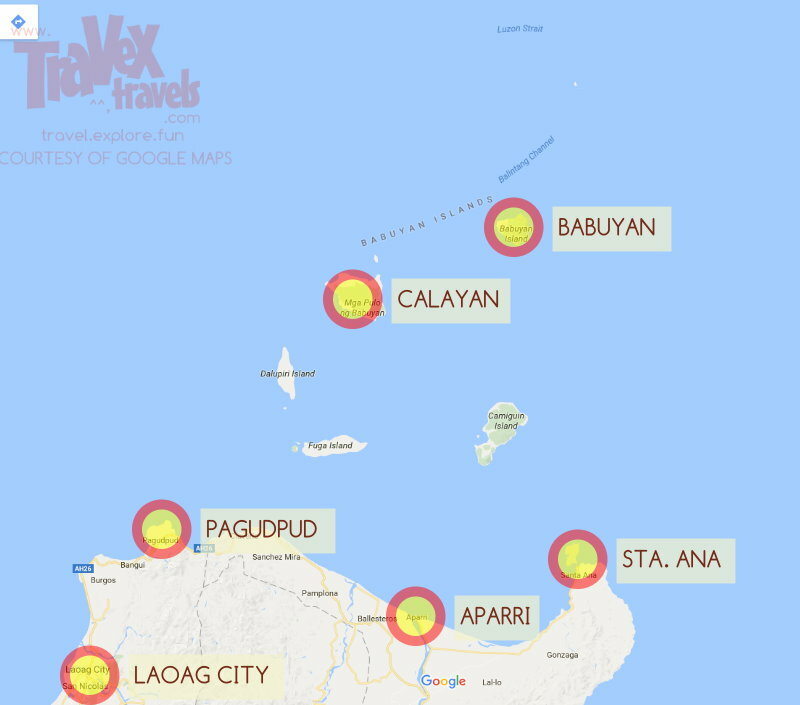 From there, San Jose to Tuguegarao City will pass through the several cities and towns in Nueva Ecija, Nueva Vizcaya, Isabela then Cagayan. You can also exit to Carmen in TPLEX then follow abovementioned directions. *Once Central Luzon Expressway is operational, you can then exit from SCTEX to CLEX all the way to San Jose City, Nueva Ecija (still a long time, maybe sometime 2024). 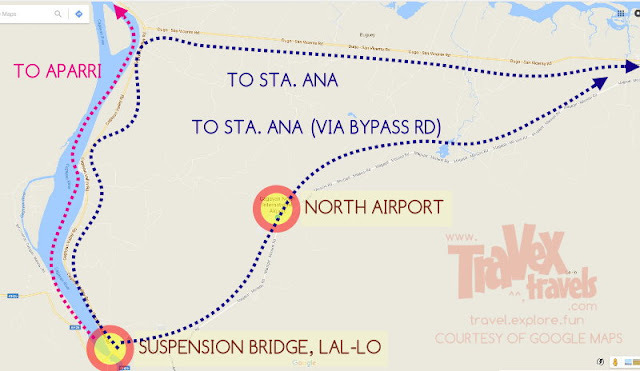 If coming from Subic-Clark area, take SCTEX-TPLEX route, then follow directions as stated above. If coming from Manila, you can ride Everlasting bus bound to Tuguegarao (roughly 12 hours), with its terminal in Welcome Rotunda, Quezon City. You can also ride Florida Bus (they also have buses bound directly to Santa Ana, Cagayan) or Victory Liner. The bus terminal is located along EDSA near East Avenue. If coming from Baguio, you can ride a Dalin bus directly bound to Tuguegarao. Their terminal is located in Gov. Pack Road. On going back home from Tuguegarao, ride Victory Liner/Florida/Everlasting (to Manila) or Dalin (to Baguio). For people going back to Pangasinan from Tuguegarao, you can ride the non-aircon bus of Five Star going directly to Dagupan in Pangasinan. **Bus terminals in Tuguegarao are located in the downtown area. The buses have their own terminal stations. If coming from Santa Ana, buses going back to Manila is located near the market (Florida Bus). 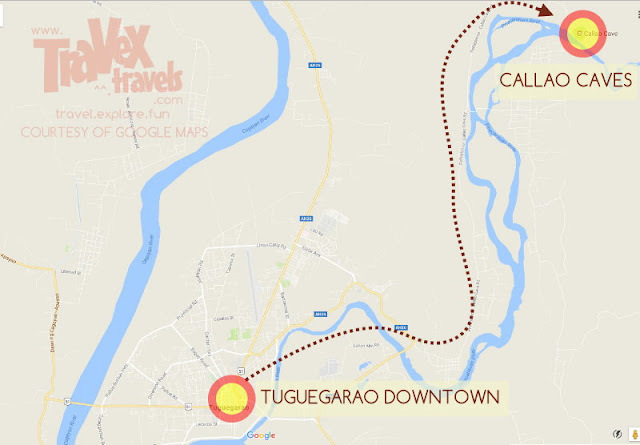 Once you reach Tuguegarao, you can already visit the Cathedral which is in the downtown. For private cars, it is easy to get to destinations since the roads that lead to the tourists spots (such as Callao) are well paved. 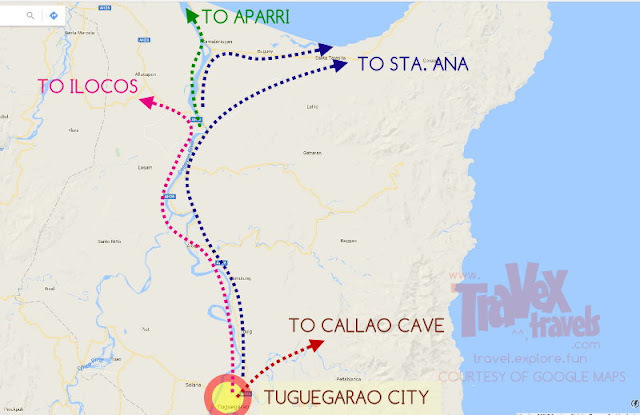 To commute, I recommend you to hire trike to bring you to Callao Cave. 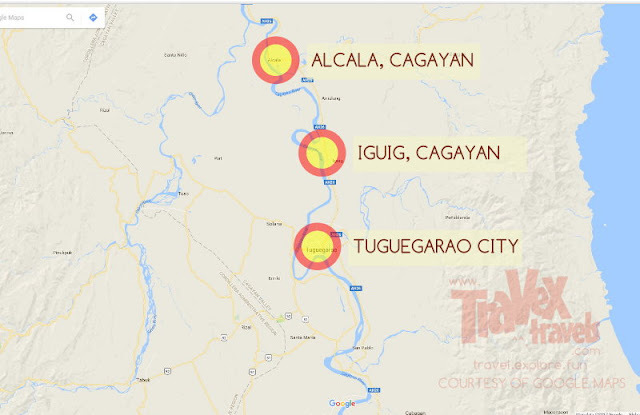 Callao Caves are located not in Tuguegarao but in Penablanca, which is a few kilometers away from the city. 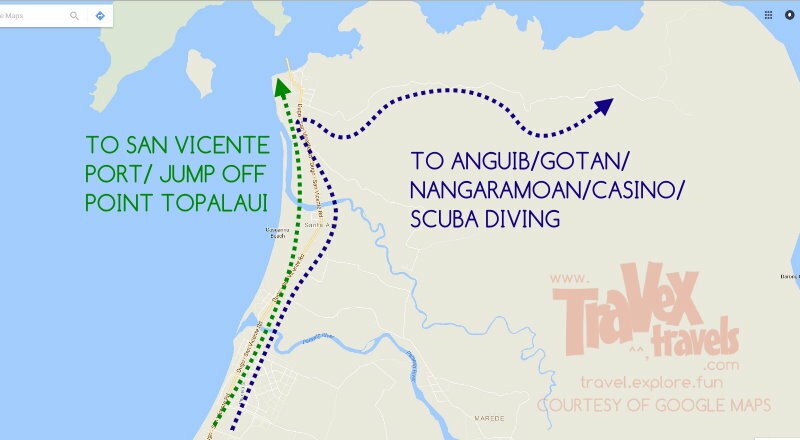 For the tourist spots located along National Highway to Aparri or Santa Ana, this is only doable for tourists who have their own private cars. 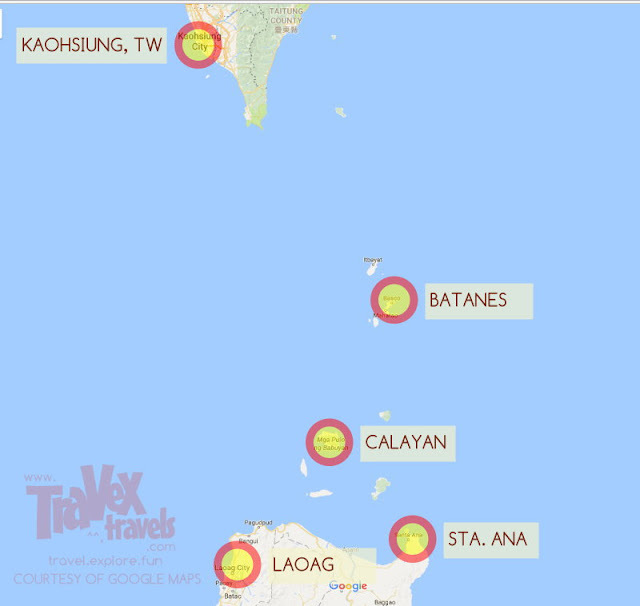 Although it is possible to visit and take photos of the different churches such as Piat, Alcala Church or the Nueva Segovia Church, commuting to these locations is a hassle since you need to cut trips. There are also buses that ply to Aparri from Manila. However, if you happen to stop over Tuguegarao, you can ride UV Express vans (~P100) in downtown area. If by private car, drive your way until you see the junction which separates the road that leads to Aparri and the road that leads to Santa Ana, Cagayan. Florida Bus has trips directly going to Sta. Ana, Cagayan. Travel time is roughly 13-16 hours. 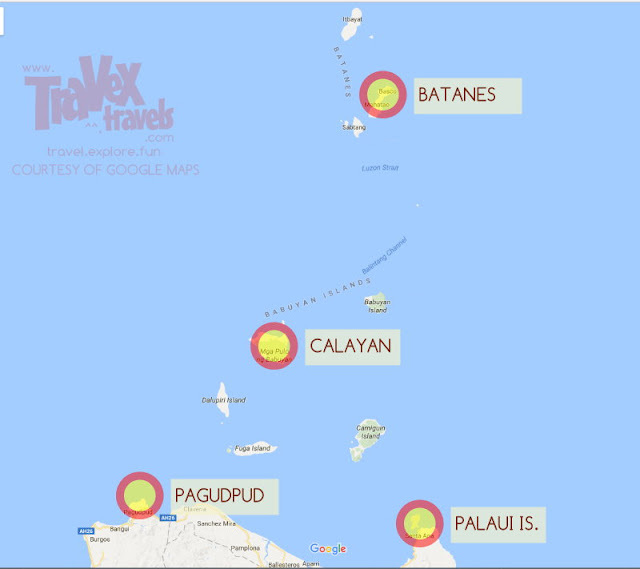 From Tuguegarao, you can ride another bus, or UV Express going to Santa Ana, Cagayan. 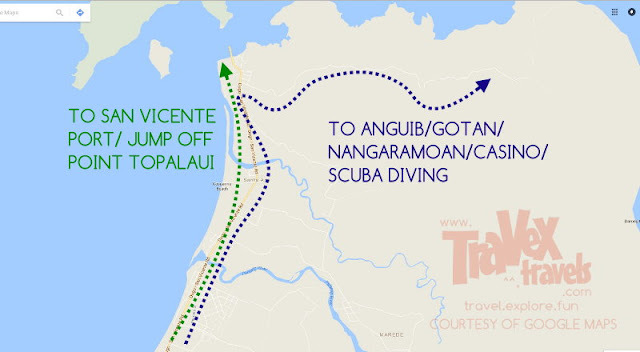 When in Santa Ana, head to San Vicente port if you want to experience island hopping to Palaui Island (Cape Engano), then a short stopover in Anguib Beach. This is an island hopping travel package. If via private car, you can directly go to Anguib Beach. 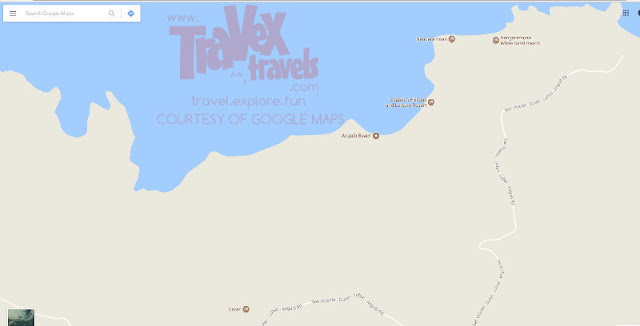 From downtown, go to junction that separates the road that leads to San Vicente port and the road that goes to Anguib. There are guards in the junction or along the road that charges you environmental fee before you are allowed to get inside. Car park is not a problem in Anguib Beach or in Gotan Beach. You can have it parked there and asked the attendants if you want a tour to Nangaramoan or the other beaches. Island hopping (Php4000) to Palaui Island is also available here in case you do not want to go to San Vicente Port. 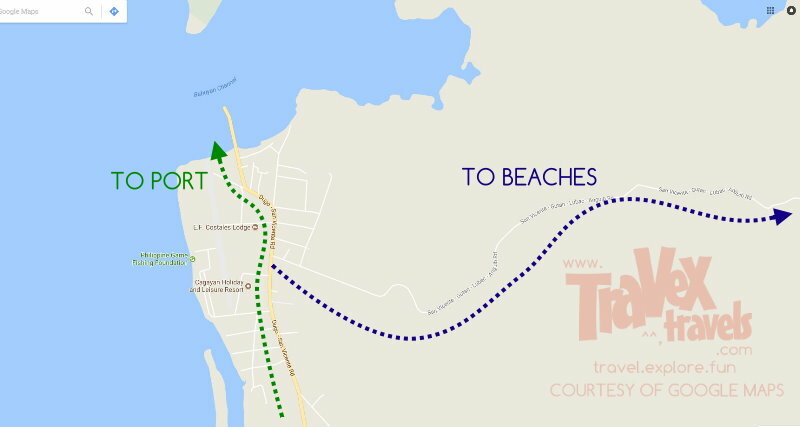 ***Note: For visitors going to Calayan Island, head to port in Aparri. The boat trip to Calayan starts in Aparri for approximately 5 hours.